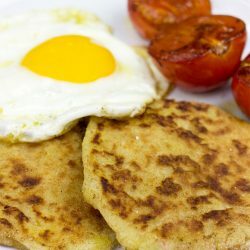 What’s the difference between a potato farl and potato bread? About as much as the difference between a cow from Northern Ireland, and one from the Republic. Potato Farls or Potato Bread? 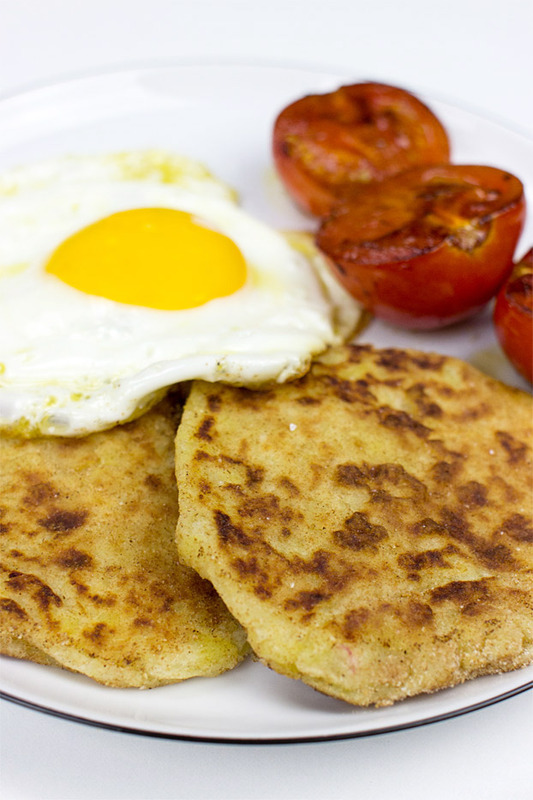 Potato farls (as they’re usually known in Northern Ireland) have long been used in the traditional Ulster fry – setting them far away from a traditional English breakfast. Head into the Republic and you’ll find them known as potato bread – but with little or no difference to the recipe itself. All that’s important is that they’re delicious, and are eaten for breakfast. Actually, that’s not quite true. 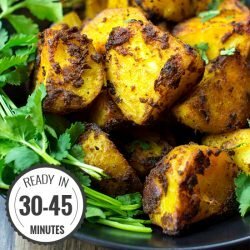 They’re delicious anytime of day, and are a great way to use up leftover spuds. With Saint Patrick’s Day on the horizon and now a hugely celebrated festival it would be remiss of us not include a good breakfast before thoughts turn to Guiness and whiskey. This potato farls (or potato bread) recipe comes from our good friend and recipe contributor, Ciaran, an Irishman living in Hamburg. If you need proof of his potato pedigree, then look no further than the amazing Irish Bombay Potatoes. One of the greatest things about potato farls is their versatility. You can change the flavour from the simple yet effective base to almost anything you want – curry powder, garlic, basil, rosemary, chili powder, grated cheese and butter. They take on the flavour of whatever you add – so good! 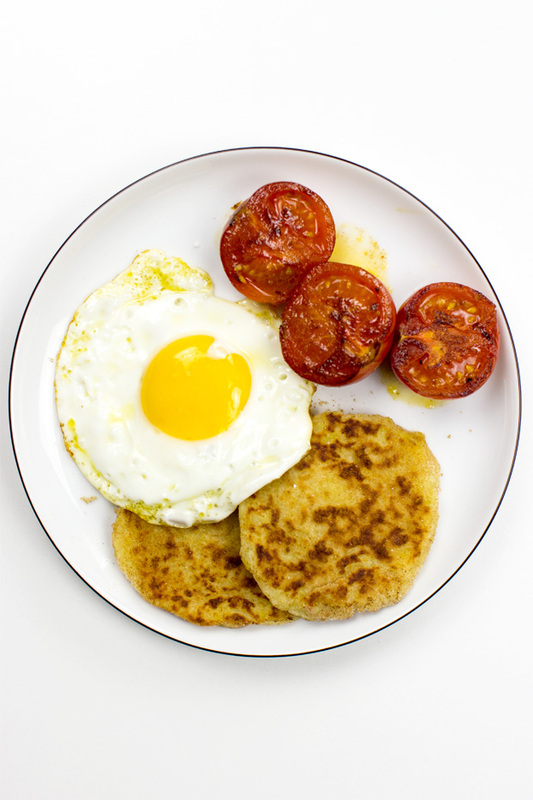 We also highly recommend serving with fried eggs and tomato – there’s a reason Ulster frys are so popular. Do not use oil to fry the farls/bread! Make sure make they have flour on the outside and they’ll cook up nicely. Using oil just makes them greasy and heavy. 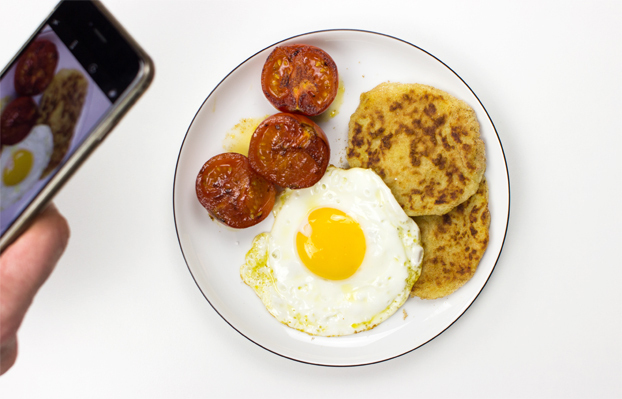 We’ve spent a lot of time thinking about breakfast recently, and how to make it more simple, more accessible and more realistic. And so we made Breakfast in Six. 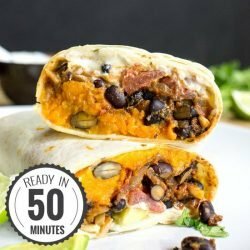 Our new ebook features recipes that are made with only 6 ingredients or less – and are really quick too. Breakfast shouldn’t be a chore – it should set us up for the day in the best possible way. While potato farls aren’t in the eBook (the 30 recipes are exclusive to the book and unavailable online) the book does use recipes from all across the world. 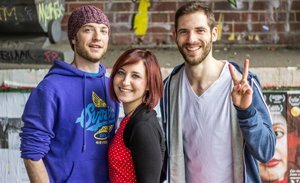 The recipes were created by another good friend, and professional chef, Jansen Schouten, who’s culinary expertise ranges from Canada to Germany to New Zealand. You can be sure of exciting new vegetarian breakfasts with little effort and loads of taste. Visit our Facebook page if you’d like to be the first to know when it’s released. Your choice of herbs/spices. Think Indian curry, Italian basil and garlic, spicy pepper flakes, grated cheddar cheese and butter. Rosemary is really good, too. Use plenty to get the flavour you want! Peel, then quarter potatoes, boil for 15 mins until easily pierced with a fork. Drain and cool under running cold water. Allow to go cold. This recipe is also perfect for using leftover potatoes. Mash the soft spuds with a fork or masher. 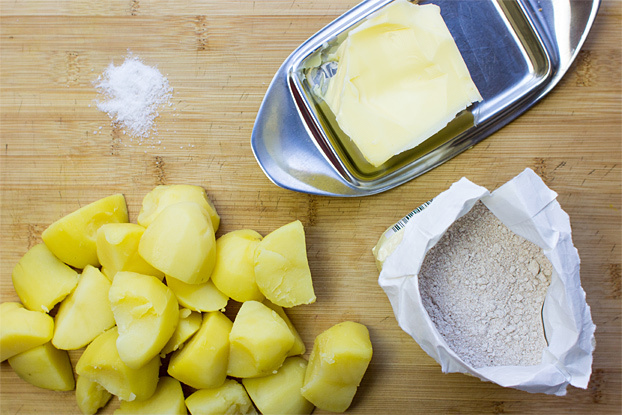 Add half the flour to the potato mix and spread the rest onto a work space. Mix the flour along with the potatoes, butter (if using), salt (and seasoning of choice) until you have a dough. 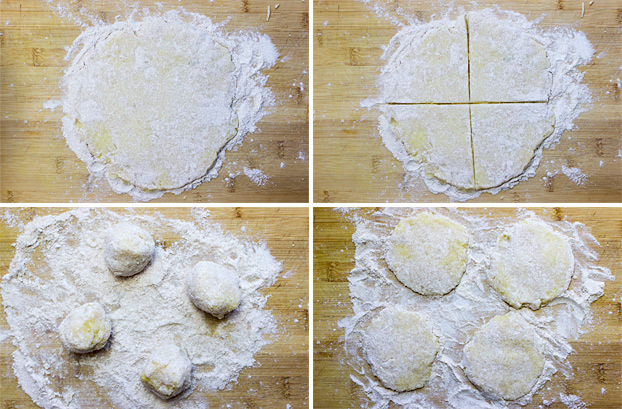 Make balls from the dough. Press the balls flat into the flour on the workspace. They should be 1-2 cm thick. Put a pan on medium heat, NO oil, then add the potato farls, (make sure each side is covered lightly with flour before putting into the pan). Cook on each side for about 3-4 minutes, until nicely browned. Serve with a little extra salt. Add some olive oil to a pan on medium-high heat. Add the tomatoes, then crack in the eggs to one side. Cook with a lid (if available) to speed up the frying process. After a couple of minutes, flip the tomatoes. Another minute or so and the eggs will be ready and tomatoes will be nicely browned . Enjoy! 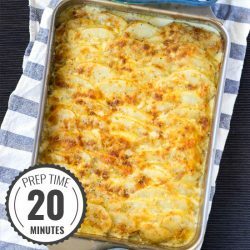 Hankering after some more potato goodness? This gluten-free potato pizza is AMAZING. It really must be tried. This beautiful potato salad should also be taken to ANY picnic or BBQ.